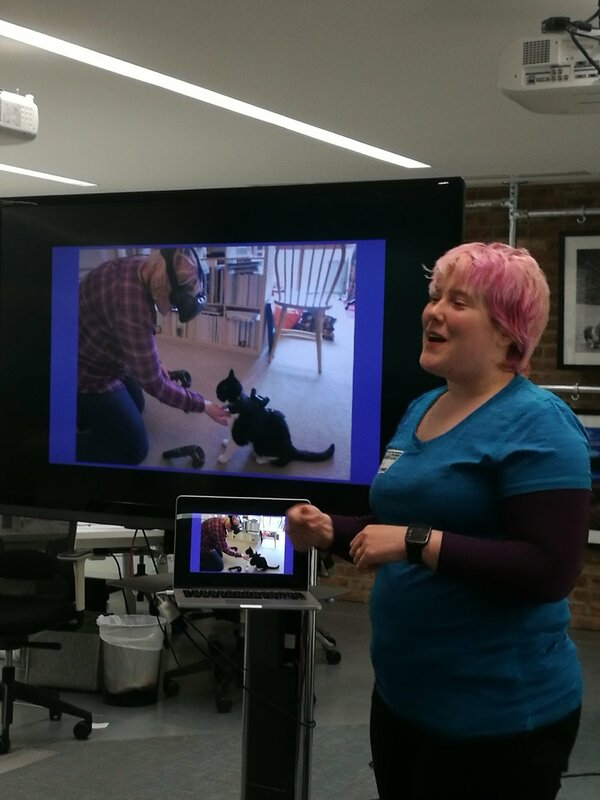 Women of Wearables hosted an evening of networking for animal lovers on wearable tech for pets and animals on 17 May 2017 in London sponsored by Thoughtworks. Our speakers included Kate Logan, Lead Product Strategist at Thoughtworks, Dr Kimberley Schiller and Grace Nolan from Felcana and Katie Goode, Creative Director at Triangular Pixels. Kate Logan from Thoughtworks explained how she was involved in prototyping of the Silent Herdsman from a UX perspective. Thoughtworks, an international software development company worked with a startup, the Silent Herdsman to help it develop an early stage prototype of a neck mounted cow monitoring system. The purpose was to develop a wearable collar that monitors and tracks cow activity. Smart farming takes the guess work out of farming. Farming costs are increasing with the labour market becoming more expensive and the ability to keep track of the herd and farming duties are becoming more and more onerous on farmers. The Silent Herdsman project aimed to detect when a cow is on heat and the changes in its normal behaviour such as eating and rumination. When a cow is on heat, Kate explained that it increases its level of physical activity. Therefore, a tracker is a perfect device to measure how much a cow is moving to determine when it is best to start the breeding process. Bringing technology to farms is the only viable solution to ensure farms maintain a competitive advantage, keep their animals healthy, the farmers happy all while reducing the costs involved in maintaining a farm. This is where data becomes very important because if it can’t be measured, it can’t be managed. In helping the Silent Herdsman develop their neck mounted cow monitoring system, Kate had to spend a lot of time on the farm to understand farm environment, cow behaviour and watch how farmers use their system to ensure they were able to use the system to its maximum efficiency. 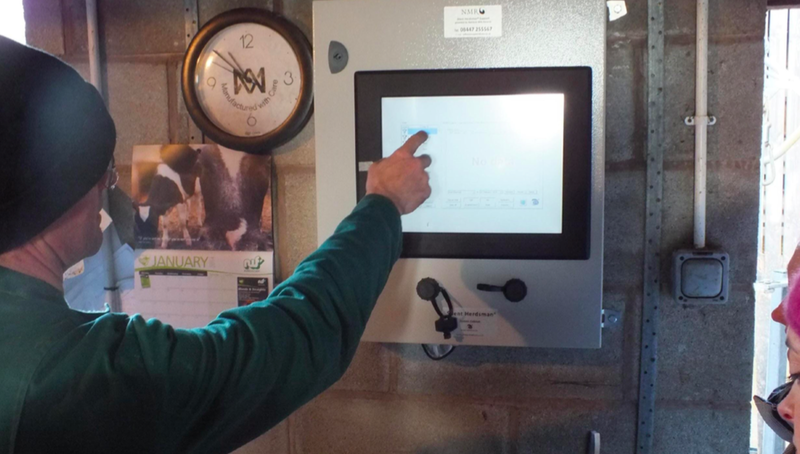 The farmers said they loved the system that gave them the necessary data of when a cow went on heat. However, in watching the farmers use the system and monitoring them 24/7, it told a different story. In reality, the farmers couldn’t touch the screen because they had gloves on and the buttons were so small. It also didn’t provide real time data and instant notification to the farmers which they needed. Testing, monitoring and continually seeking feedback from the farmers ensured that Thoughtworks and the Silent Herdsman could develop a system that not only worked but that farmers and stakeholders could actually use. The key learnings in working on the wearable system was to prototype with low fidelity. This is UX speak for making rough representations of prototypes to validate early stage concepts. In this case, Kate initially used paper prototyping to understand very quickly how the system could work and validated it by asking users to interact with their paper prototypes before moving onto developing the actual software and hardware. Kate also advised to keep testing ideas and keep getting feedback from different users and other stakeholders. 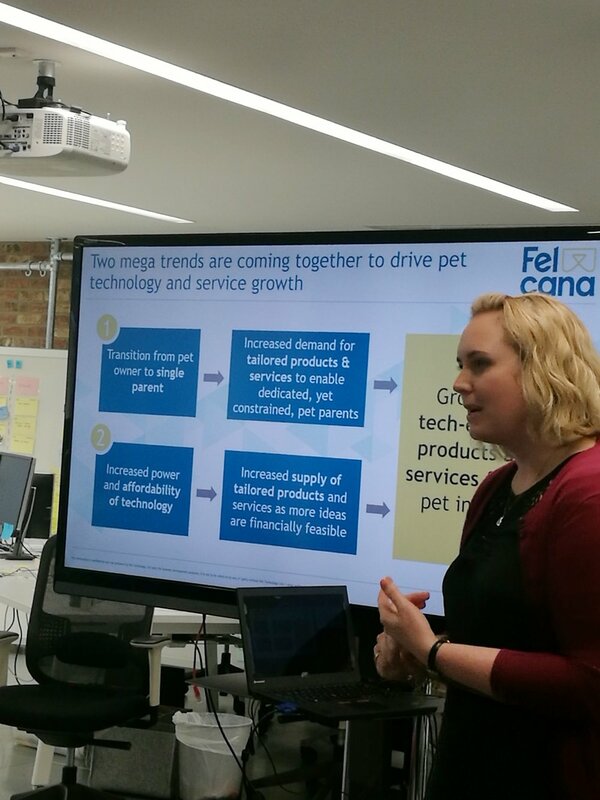 Moving onto pets, Dr. Kimberley Schiller, co founder of Felcana and former vet discussed 2 pet megatrends: Humanisation of pets and technology being more affordable. In a survey conducted in the US, 95% of pet owners consider their pet as family members. 76% of pet owners refer to themselves as “pet parents” and 46% of pet parents are buying birthday presents for their pets! There is also a clear link between the level of the bond of a pet to how much a pet owner spends on their pet. The higher the bond, the higher the spending. Also, with people delaying marriage and having less children together with an ageing population, it’s no wonder more people are also having pets for companionship. The increase in the affordability of technology and the internet of things has led to more connectivity resulting in data sharing. People want answers quickly therefore more tech businesses must meet the demands of a pet parent. Felcana is a wearable tech start up that developed an ecosystem of connected and responsive smart devices monitor your pet. Grace explained that they worked with Precipice Design to develop a beautiful device that clips onto your pet’s collar to track and measure data. Precipice Design viewed the design process from a meaning-centred design perspective by looking at animals as sensing, sentient beings and how they interact with humans. It also comes with a beacon that is placed in and around the home to track the activities of a pet such as: how long it stays at the water bowl, how long it sits in the kitty litter, how long it sleeps in the bed for or how many times it gets up. A pet’s activity is one that needs to be measured to detect illness. These are the common questions a vet would ask when a pet parent takes its pet to the vet. How long a pet spends at the water bowl drinking could mean early signs of diabetes. How long they spend in their bed in the morning and not running around as often could mean early signs of arthritis. How many times it goes to the toilet could indicate a bladder infection. When busy people hire dog walkers, it will allow them to keep connected to their pet and track how much exercise it is getting when they aren’t there. Felcana is co-founded by vets which allows pet parents feel closer to their pets and help them detect any early signs of illness. Katie Goode, Creative Director of Triangular Pixels, a VR game company based in Cornwall discussed how she came up with the idea of developing the Tracker VR. While her partner played a VR game they developed, in walked their cat who subsequently got kicked out of the way accidentally. That was a eureka moment when they decided to develop a way for their cat to be involved as well as safe while they play their games in virtual reality! The Tracker VR is a two part project, one part code, another craft. The aim is to give players a warning of unpredictable pets/children when they enter the space, and the potential to of course – actually see their companion in games. Hacking into a HTC vive by clipping the sensor onto a cat jacket, Katie and her team were able to develop an app to allow her cat to show up in their VR games thereby being safe from being kicked out the way and being involved in the game itself! Katie explained that her cat is now famous with the Discovery Channel knocking on her door in Cornwall to be interviewed about her side project. It was a brilliant night at Thoughtworks London who sponsored our meetup with good company, pizza, refreshments and more importantly, it was pretty clear during our networking that we don’t look at animals the same way as we used to. If you can get it for a human, you should be able to get it for a pet! At our next meetup, we will discuss Women & Fashion Technology in London on Monday 12 June 2017. Tickets are limited so book your tickets here!